With the work by D. Myers and B. Blake (2017), it has become apparent that the Consistency Dimension should include an additional Underlying Concept to measure the aspects of uniformity of values over time. The extent to which a data value ordinates from trustworthy sources. The extent to which a data value is reasonable (likely). Definition: The extent to which a data value is consistent with other values of the same data. The extent to which a data value is credible based on proximity of transaction time to valid times. The extent to which a data value is derived from data values with overlapping valid times. 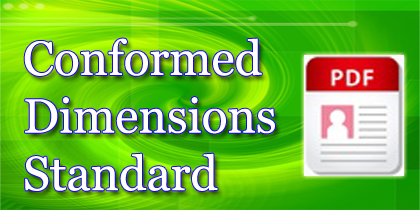 General statements associated with expectations of consistency or reasonability of values, either in the context of existing data or over a time series, are included in this dimension. The value of one set of attributes is consistent with the values of another set of attributes. New values are consistent with expectations based on previous values. Service level agreements (SLA), security agreements, and other authoritative documents governing data provider performance will be defined. The data meet rational expectations. 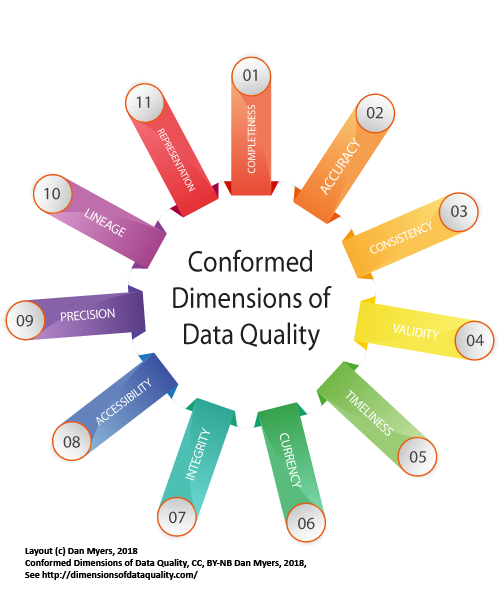 When possible, poor data quality will be improved by implementing data correction processes. Prat and Madnick (2008)- In Prat and Madnick's definition of Believability, Reasonableness of data, they included a metric "Consistency" defined as, "The extent to which a data value is consistent with other values of the same data" and included two sub-types, 'Consistency over sources: a data value is possible' and 'Consistency over time: the data value is consistent with past data values'. (Table 1, Page 4). Loshin (2011)- Loshin identified the Reasonableness dimension and the concept of "Temporal Reasonability" defined as "New values are consistent with expectations based on previous values." (Table 8.10, Page 143). We believe that the term Consistency here is proxy to his description of the underlying consistency of the value- which drives what he calls Believability. The measure of uniformity of the data compared to historical values. Loshin, The Practitioner’s Guide to Data Quality Improvement, Elsevier 2011. Myers, Dan and Blake, Brian. “An Evaluation of the Conformed Dimensions of Data Quality in Application to an Existing Information Quality-Privacy-Trust Research Framework” in Proceedings of International Conference of Information Quality, Little Rock, AR, 2017. Prat, Nicolas and Madnick, Stuart. “Measuring Data Believability: A Provenance Approach” in Proceedings of the 41st Annual Hawaii International Conference on System Sciences, Waikoloa, HI. 2008.